The Essential (and Complete) College Dorm Packing List NEW! You can find hundreds of free PowerPoint templates and backgrounds here at Brainy Betty, but we have so much more: we have animations, music for presentations, royalty free photos, tutorials, flash and video introductions, teacher resources and backgrounds for presentations to name just a few. Over 92 million unique visitors since 2000! Join our Facebook Fan site to get daily freebies. Be sure to view our YouTube channel for lots of video tutorials to make your presentations the most unique anyone has seen! Or follow us on Twitter or Pinterest! You can also access our Microsoft Office Template Channel. Enjoy! Use the menu options to your left to navigate this site. The text menu (SEE BELOW) is best for new visitors. We have over 800 pages of free resources on this site - please be sure and bookmark us! Explore the menu below for links to all the content. 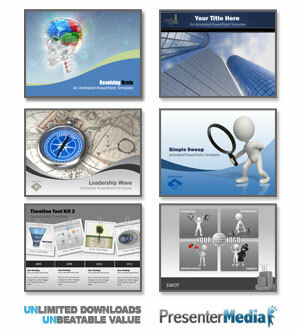 Free Graphics for Presentations and Web Pages, Blogs, Profiles and more! Printable School Posters | 2010 NEW Posters Miscellaneous, New and Etcetera! Ribbon Template Free Software (FREEWARE) Where to Find it! Scrapbooking Stencils and Links 3 pages of free Halloween and Fall Downloads - graphics, backgrounds, spooky music, crafts and more! 6 free Valentine postcard printables Thanksgiving - templates, crafts, recipes and more! VIDEO for presentations! Betty's Article Directory: Quick Reads to Learn Something New Today! Betty's BIG List of Public Domain Resources!